Ashton Old Hall stood on a spot once occupied by a small fort built for the King of Northumberland. It was on a small hill overlooking a crossing-place of the of the River Tame. At that time the river formed part of the boundary between the Kingdoms of Northumberland and Mercia so this was a defensive border post. The fort occupied a position defended by a steep rise from the river to the south and a dry moat or fosse to the north. The Old Hall which was later built on this site was the feudal manor house for the district and had been the family home of the Assheton family. The arches and round towers were thought to have been built around 1379, but there was probably a hall on the site for 300 years before that. Parts of the building were added in 1480 and a part known as the dungeons was added around 1516 and may have been used as a prison. The Lords of the Manor moved to Dunham Massey Hall around this time. Ashton Old Hall, looking north-east. 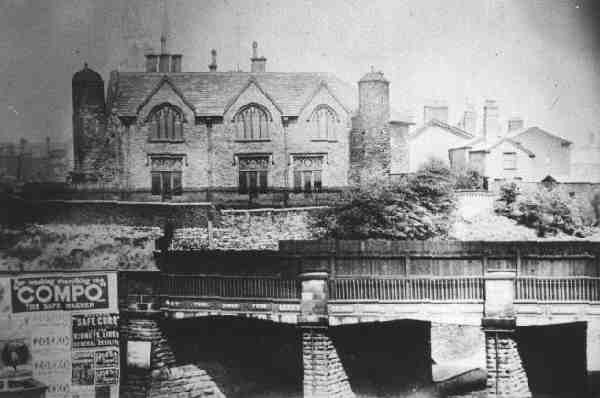 Picture courtesy of Tameside Local Studies Library. No reproducing without permission. By the 19th century the Hall was becoming dilapidated. It was refurbished in 1840 to be used as a base for the Earl of Stamford and Warrington during his visits to the grouse-shooting moors above Stalybridge. 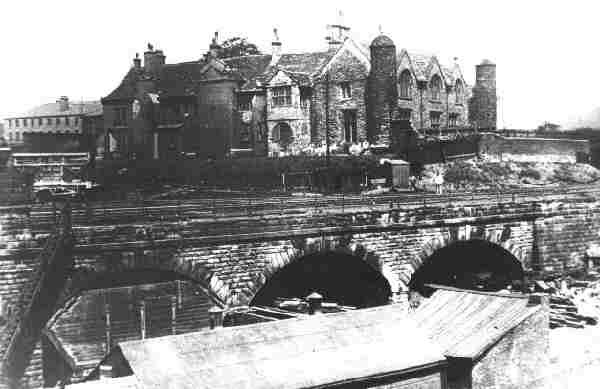 In 1893 the Hall was acquired by compulsory purchase by the Manchester, Sheffield and Lincolnshire Railway Company, whose line ran past the Hall, and was demolished despite opposition from the town council. The site of the Hall is between the by-pass and the railway, a little west of the present Employment Exchange. Ashton Old Hall, looking north-west.